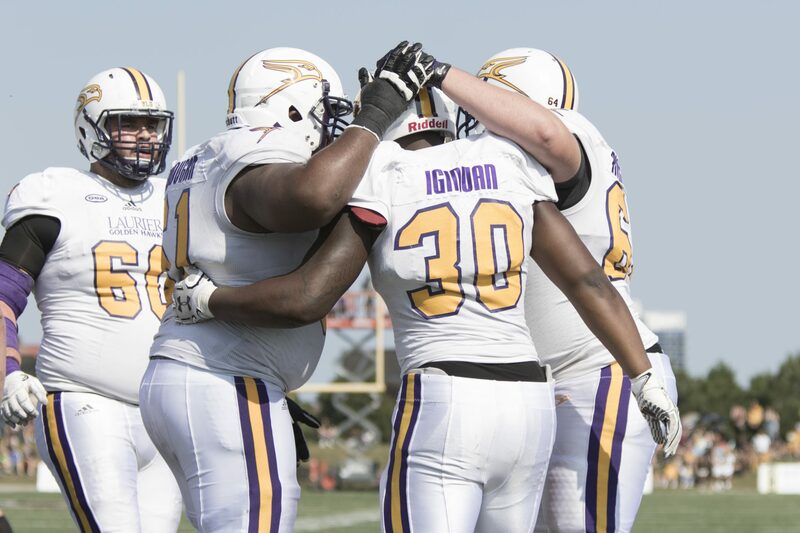 The Golden Hawks prevailed in the Battle of Waterloo against the Warriors this past Saturday. The game was very tight in the first quarter, as both teams were trading punches. In the second quarter, the Hawks started to pull away, thanks to two interceptions, a huge 44-yard touchdown from Michael Knevel to Brentyn Hall and a 65-yard punt return touchdown. The Hawks led at halftime by a score of 33-15. Laurier took control of the game in the second half and never looked back, as they ended up dominating the Warriors, winning by a final score of 71-24. “Obviously it was kind of back and forth a little bit in the first quarter. We took a 12-0 lead and then they came back.,” head coach, Michael Faulds said after the game. “So the game is won and lost on a few plays here and there towards the end of the half, getting a touchdown on offense and then following it up with a 2-and-out on defense, followed by 65-yard punt return touchdown,” he continued. Although the Hawks won this game with ease, there were some negative plays for the defense in the first half. Tre Ford, quarterback for the Warriors, caused the Hawks’ defense many issues as he was constantly escaping the pocket and rushing for big yardage. The Hawks compounded the problem by adding on a few late-hit penalties. “Penalties are always a focus for us. It’s always something we try to clean up. We’re a tough, hard-nosed football team,” Faulds said. Both the Hawks and Warriors were undefeated coming into the game. This led to many fans thinking that the game would be tightly contested. But the Hawks showed why they are the defending Yates Cup champions. “I think the outcome of Waterloo is kind of what we expected. A lot of people outside of our program thought it was going to be this very tight game. We’re very confident in our abilities. We’re right where we’d thought we’d be at this point of the year at 4-0,” Faulds said. Next up for the Hawks is a rematch of the Yates Cup final. In what many people will call the biggest game of the season, the Hawks will need everybody to be at their best. Faulds mentioned that the Yates Cup victory was a deserved one for the Hawks and they are going to need some big plays to win again. “A lot of people think it was a fluke that we won that game. But I think a lot of people are forgetting we were leading at halftime. So was that whole first half a fluke as well?” Faulds pondered. “We’re going to need several big plays again this week. We’re going to need defense, special teams and offense to play their best game of the year for us to win this football game,” he said. Although it is very early to be looking ahead to the playoffs, this Hawks team looks like a strong contender once again. “As of right now, we have a ton of room to grow. Do I think we could get to that point by November 25? I do. Would a September 24 team be ready for that? No. It’s a long season and we have to continue to grow each week,” Faulds said. The goal for the players is the Vanier Cup and with all the talent on this team, the sky is the limit for the Hawks.